Call today to find out if SRS/SRT can help your pet. Our Pet Advocates will help you find out if your pet could benefit from SRS/SRT. Want more information? 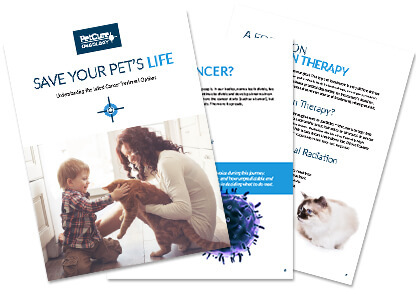 Download our pet cancer eGuide to learn more about potential treatment options. The treatment and recovery were seamless, a cakewalk, and before I knew it, Cass graduated on Friday as a Pet Hero! Compared to where he was, it’s a miracle. Copyright ©2018 PetCure Oncology. All rights reserved. Fill out the form now to receive your eGuide with more information about treatment options and how our innovative cancer treatments have saved thousands of pets’ lives — and could save yours.